French journalist Delattre smoothly chronicles the impressive wartime activities—and woeful postwar treatment—of a German foreign ministry official who passed critical strategic information to the OSS. 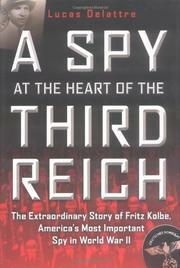 From 1943 until the end of WWII, Fritz Kolbe supplied hundreds upon hundreds of cables and rolls of film containing important tactical and strategic information: the installation of a clandestine listening post in Dublin, the existence of a mole in the British Embassy in Ankara and an informer in the entourage of the vice-president of the US, the negotiations between the Nazis and the Soviets toward the closure of hostilities, and the sale of German gold to Switzerland. As time went on, Kolbe took increasing risks that on several occasions nearly cooked his goose. This sympathetic portrait depicts the official as motivated quite simply by his horror of the Nazi Party and its murderous worldview; he helped the American intelligence services purely from conviction and never asked for payment. Delattre’s leisurely narrative never strays far from the documented facts; when the author offers a conjecture, he says so, and it never seems much of a stretch. For example, when discussing Kolbe’s inability to secure postwar employment, the author suggests that he was considered a traitor in his homeland because his information had resulted in the deaths of civilians—and he was still alive, which made him all the more contemptible. This German hostility is not so surprising; far more shameful was the US anti-Soviet policy, which allowed the old networks of the Nazi period to resume control and sent Kolbe to the dustbin. He just wasn’t a good Party man.